Created in 1917, the year of the Great October Revolution, Mikhail Nesterov's portrait was at the centre of a whole series of events occurring around, or in direct connection with it under the "hallowed arches” of the Trinity Lavra of St. Sergius in Sergiev Posad. It can, indeed, be seen as something of silent witness, having observed the momentous upheavals of those times. From the point of view of composition, the painting constitutes a double portrait in the Renaissance tradition. Two profiles are situated side by side, so close as to be almost overlapping. From the point of view of form, however, the work should be viewed as a single portrait, the figures indissolubly linked in an emblematic image. Bulgakov's apocalyptic interpretation is, perhaps, more appropriate for his own image than for that of Pavel Florensky: where Bulgakov is shown wrapped in a dark coat, his face expressing intense, if suppressed, inner conflict, Florensky appears in a snow-white cassock, head tilted slightly as he listens to his friend. Florensky's calm, humble acceptance of his own fate is stressed by his gesture, as he lays his hand on his chest. A gentle, meek figure, he nonetheless generates a sense of impending tragedy. According to Bulgakov, Nesterov's portrait was begun one May evening in 1917, in Florensky's garden in Sergiev Posad. The light was fading into dusk, as the sun sank slowly to rest: the twilight hour, before the first evening star, was Pavel Florensky's favourite time of day. The rosy heavens in the background call to mind the feminine images evoked at dawn and sunset by Mikhail Lermontov, Vyacheslav Ivanov and other authors: in his essay "Celestial Signs” (Nebesnye Znameniya), Florensky interpreted these female images as premonitions of Sophia, Divine Wisdom. The two philosophers are, perhaps, discussing Sophia as they sit, the topic holding special importance for both: that very year, Bulgakov wrote on this subject in his essay "The Unevening Light: Contemplations and Meditations” (Svet nevecherny. Sozertsaniya i umozreniya) (Put, Sergiev Posad, 1917). In "The Stratification of Aegean Culture”, Florensky looks at archaeological and philosophical matters, exploring the importance in ancient cultures of feminine power and influence - the term "influence” possessing, for Florensky, a meaning somewhat different to that accepted today. In his study, he refers frequently to Jakob Bachofen's work on matriarchy, extremely popular at that time. Are these two details - the ancient Cora's eternal smile, and the inscrutable remoteness of the Earth Mother - not the two very poles of which Florensky spoke in his debate on femininity in ancient culture? Aphrodite and the stone "babas” (menhirs)? Florensky's preference is somewhat surprising. The philosopher, it seems, felt no overwhelming enthusiasm for the grand synthesis of Russian culture conveyed in his friend Mikhail Nesterov's painting "The Christians (In Rus. The Soul of the People)” (1914 - 1916, Tretyakov Gallery, Moscow), although chronologically, and ideologically, this canvas was closely linked to the double portrait discussed above. Nesterov's initial plans for "The Christians” were made around the time of Florensky's research into Cretan and Mycenean iconology. The fruit of the artist's work was a large painting, 'The Christians' (In Rus. The Soul of the People), whereas the philosopher's studies resulted in the brochure "The First Steps of Philosophy”. Around that time, Nesterov was in close contact with Vasily Rozanov. His meeting with Florensky occurred in the summer of 1916, as he was working on the final version of 'The Christians'. The Pavel Florensky Museum contains a note on this meeting, dated "10 May 1916” and written in Florensky's hand. By the summer of 1916, the painting was all but finished. The main value of the canvas was seen by Nesterov as philosophical, rather than artistic: the artist frequently discussed the painting with religious philosophers. When, in early 1917, the work was completed, Florensky and Bulgakov both came to visit the painter, who hoped, presumably, to be assured of their approval. Florensky's guarded criticism of "In Rus” found expression not only in his "Lectures on Spatiality and Time in Works of Art”, given at VKHUTEMAS, The Higher Art and Technical Workshops, between 1921 and 1923. As his sharp comments on the neo-Russian murals of the "odd-looking Cathedral of St. Vladimir in Kiev”, show, the philosopher had reservations concerning the neo-Russian style of art as a whole. Primarily directed at Wilhelm (Vasily) Kotarbinsky (1849-1921), these comments were also intended for Viktor Vasnetsov - thus, Nesterov, who had worked with both, was also indirectly involved. 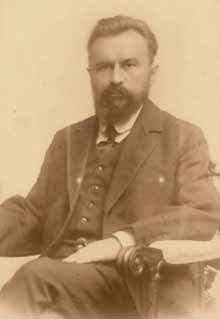 In similarly independent spirit, however, Florensky also wrote of those works which he considered to be examples of successful space-time synthesis. Through the powerful use of symbols, he claimed, these captured the spirit of their time. His preferences are, at times, most unexpected: in the "Analysis of Spatiality”, for instance, he contrasts Nesterov's "In Rus” with Jean-Antoine Watteau's elegant, frivolous "Pilgrimage to the Isle of Cythera” (1717, Louvre Museum, Paris), holding the latter up as an ideal model of space-time synthesis. 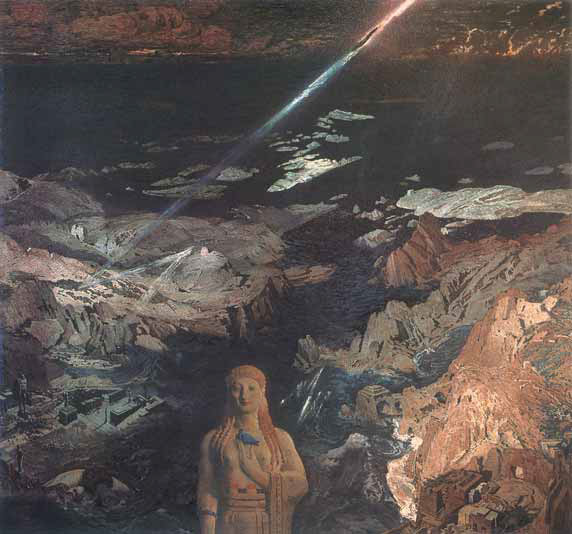 Similarly, in 1908 he accepted the vague, esoteric content of "Terror Antiquus” by the decadent Bakst, finding in this painting the symbolic ancient synthesis of which he had written in his "Stratification of Aegean Culture”, using both classical and symbolist sources as examples. Interestingly enough, the completion of Bakst's painting coincided with the beginning of Florensky's series of lectures on ancient philosophy. Naturally, Florensky's view of realism could not accommodate the pompous images of socialist victories. Neither, however, could it sit with Nesterov's praise of Orthodoxy, sung as it was with the artist's particular brand of naturalism. In his article "To the Honoured "Makovets”, Florensky voiced his reservations about "stylisers”, making the distinction between his own view of realism, and that propounded by the "stylisers” of neo-Russian art, Dmitry Stelletsky (1875-1947) in particular. At the same time, a number of factors exist which might have prompted Florensky to regard Stelletsky in a favourable light. Not only did this artist attempt to use the Russian icon form in his paintings, but he was also a close associate of Vladimir Komarovsky (1883-1937) and, most importantly, of Yury Olsufiev (18781939). In constant contact with both as an artist and as a friend, Stelletsky knew Olsufiev, and worked with him, before the latter's emigration to Paris in 1913. 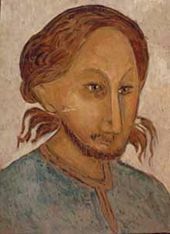 There exists, indeed, a portrait of Yury Olsufiev's son in medieval dress, painted by Stelletsky. Florensky knew and loved both Komarovsky and Olsufiev, holding the artists in the greatest esteem. Vladimir Komarovsky created several portraits of the philosopher, using the synthetic language of icons in an innovative way: today, these can be viewed in the Pavel Florensky Museum. Yury Olsufiev, like Florensky, was a member of the "Committee for the preservation of ancient monuments and works of art” of the Trinity Lavra of St. Sergius. Naturally, its very name - "The Philosophers” - burdens our portrait with a certain "baggage” from the very outset: the same is also true of Nesterov's later portrait of Ivan Ilyin (1882-1954), which bears the title "The Thinker” (1921-1922). These works can justly be seen as the conclusion of an entire cycle of symbolist portraits of prerevolutionary Russian cultural figures. Of all the portraits from this cycle, the most convincing is the double image of Sergei Bulgakov and Pavel Florensky. There is an element of illustration in this work, Nesterov having decided to place a view of Abramtsevo in the background. The Abramtsevo landscape was seen by Florensky as the main element in the spiritual structure of the Lavra's grounds. The philosophers' special connection with Abramtsevo was further reinforced, when on 26 July 1916 Alexandra Mamontova, guardian of Abramtsevo and daughter of Savva Mamontov, founder of the Abramtsevo Art Circle, brought Nesterov to Florensky to discuss the future portrait. There were, indeed, many factors which prompted Nesterov's decision to substitute the real view behind the two philosophers - that of Florensky's garden - with the hills of Abramtsevo. Nesterov spent the summer of 1917 in Abramtsevo, and wished to stress the emotional and symbolic importance of this spot both for himself, and for his two friends. A peaceful retreat, where nature and culture could both be enjoyed, Abramtsevo could also serve as a safe haven, should disaster strike. The portrait was finally purchased by the Tretyakov Gallery in 1964. 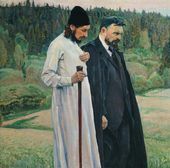 Over thirty years after Nesterov's initial offer, "The Philosophers” was acquired from the artist's daughter, Natalia Nesterova: thus, the idea and its proponents were finally rehabilitated. Nesterov's "The Christians (In Rus.The Soul of the People)” (1914-1916) was acquired by the Tretyakov Gallery in 1958, and "The Thinker” (1921-1922) joined the State Russian Museum collection in 1963. Today, as the personality and ideas of Pavel Florensky continue to arouse growing Russian and international interest, this beautiful portrait is not merely a prized piece in the State Tretyakov Gallery, but also a witness - and a reflection - of an entire era. Sergei Nikolaevich Bulgakov (1871-1944) - priest, philosopher and economist. Ordained in 1918, Bulgakov was exiled from Russia in 1922. Moving to Prague, then to Paris, he was one of the few Russian intellectuals who maintained contact with Florensky after emigrating. A broad overview of his philosophy is given in Catherine Evtuhov, "The Cross and the Sickle, Sergei Bulgakov and the Fate of Russian Religious Philosophy”, Cornell University Press, Ithaca, 1997. Bulgakov's thoughts on Sophia, Divine Wisdom can be found in Sergei Bulgakov, "Sophia, the Wisdom of God: An Outline of Sophiology”, revised edition, Hudson, New York, Lindisfarne Press, 1993 (La Sagesse de Dieu Resume de Sophiologie), ed. C. Andronikof, L'Age d'Homme, Lausanne, 1983. Deacon Sergiy Trubachev, "Pavel Florensky and Mikhail Nesterov” (PAFlorensky i M.V Nesterov), in "Selected Articles and Studies” (Izbrannoye. Statyi i issledovaniya), Progress-Pleiada, Moscow, 2005, pp. 345-359. The minutes from the conference held in the Abramtsevo Museum appear in "Abramtsevo. Documents and Studies” (Abramtsevo. Materialy i issledovaniya), no. 6, Sergiev Posad, 1994, pp. 12-20. Fr. Sergiy Bulgakov, "Father Pavel Florensky” (Sviashchennik Pavel Florensky), in "Slovo”, 1989, no. 12, p. 29. Pavel Florensky, "Celestial Signs. On the Symbolism of Colours: a Meditation" (Nebesniye znameniya. K simvolike tsvetov (meditatsiya). In Fr. Pavel Florensky, "Works" (Sochineniya) in 4 vols. Moscow, 1996, vol. 2, pp. 414 - 418. Florensky was well acquainted with this debate through his close contacts with the symbolists at that time. Ample material on this topic can be found in Ye. Ivanov (ed. ), "Pavel Florensky and the Symbolists. Literary Experiments, Articles and Correspondence" (Pavel Florensky i simvolisty. Literaturniye opyty, statyi, perepiska), Yazyki Slavianskoi Kultury, Moscow, 2004. See Pavel Florensky's essay "The Stratification of Aegean Culture" (Naplastovaniya egeiskoi kultury) in Fr. Pavel Florensky, "Works" (Sochineniya) in 4 vols. Moscow, 1996, vol. 2, pp. 91 - 130. Published under the single title "The First Steps of Philosophy" (Perviye shagi philosophii), the three texts - "The Stratification of Aegean Culture" (Naplastovaniya egeiskoi kultury), "Lecture and Lectio" (Lektsiya i Lectio) (in lieu of introduction to the lecture course) and "The Forefathers of Philosophy" (Prashchury liubomudriya) - were part of a series of lectures on ancient philosophy, given at Moscow's Academy of Theology between 1908 and 1918. Hegumen Andronik (Alexander Trubachev), "Father Pavel Florensky - Professor of the Moscow Ecclesiastical Academy" in the anthology "Theological Works" (Bogoslovskiye trudy), Moscow Ecclesiastical Academy, 300 years (1685 - 1985). Moscow, 1986, pp. 226 - 232. Bulgakov's first meeting with Florensky most probably occurred in 1906: his first letter to the philosopher is dated that year. This letter can now be seen in the Pavel Florensky Museum, Moscow. Johann Jakob Bachofen, "Myth, Religion, and Mother Right: Selected Writings of J.J. Bachofen", translated from the German by Ralph Manheim. Princeton University Press, New Jersey, 1967 (Das Mutterrecht. Eine Untersuchung Liber die Gynoikratie der Alten Welt und ihrer religiOsen und rechtlichen Natur), Krais und Hoffmann, Stuttgart, 1861. Quoted from Trubachev, "Pavel Florensky and Mikhail Nesterov", pp. 355 - 356. Pavel Florensky, "The Forefathers of Philosophy" (Prashchury liubomudriya). In Fr. Pavel Florensky, "Works" in 4 vols. Moscow, 1996, vol. 2, p. 84. Mikhail Nesterov, "Letters" (Pisma). Leningrad, 1988. Deacon Sergiy Trubachev, "Pavel Florensky and Mikhail Nesterov", p. 350. Mikhail Nesterov, "Memoirs" (Vospominaniya). Moscow, 1985, p. 334. On Nesterov and Florensky's friendship, see Trubachev, "Pavel Florensky and Mikhail Nesterov”. The Florensky family archive contains six letters from Mikhail Nesterov to Pavel Florensky, written between 1916 and 1923. Mikhail Nesterov, "Letters” (Pisma). Leningrad, 1988, p. 258. Pavel Florensky, "An Analysis of Spatiality” (Analiz prostranstvennosti). In "Collected Works. Articles and Studies on the History and Philosophy of Art and Archaeology” (Sobraniye sochineniy. Statyi i issledovaniya po istorii i philosophii iskusstva i arkheologii). Moscow, 2000, pp. 229 - 232. Viktor Vasnetsov (1848-1926) worked on the murals for the Cathedral of St. Vladimir between 1885 and 1896, coordinating the work of his fellow artists. One of these artists was Wilhelm Kotarbinsky, a typical representative of the Russian "pompier” style of the second half of the 19th century. The murals inside the cathedral were largely painted by lesser known artists, although several famous painters, like Nesterov and Mikhail Vrubel, also took part. Pavel Florensky, "An Analysis of Spatiality” (Analiz prostranstvennosti), p. 232. Pavel Florensky, "To the Honoured "Makovets” (Letter to N.N.Bariutin)” (V dostokhvalny "Makovets” (pismo N.N.Bariutinu). In Fr Pavel Florensky, "Works” in 4 vols. Moscow, 1996, vol. 2, pp. 628 - 629. For a history of the friendship between Olsufiev, Neradovsky, Komarovsky and Stelletsky, see Yury Olsufiev, "On the Recent Past of One Estate: Buetsky Dom as We Left It on 5 March 1917” (Iz nedavnego proshlogo odnoi usadby Buetski dom, kakim my ostavili ego 5 marta 1917 goda). In Olsufiev's memoirs, edited by Gerold Vzdornov, in "Nashe Naslediye” nos. 29/30, 1994, pp. 91 - 131 and no. 31, 1994, pp. 97 - 123. M.S.Trubacheva, "The Committee for the Preservation of Ancient Monuments and Works of Art of the Trinity Lavra of St. Sergius, 1918-1925” (Komissiya po okhrane pamiatnikov stariny i iskusstva Troitse-Sergievoi lavry, 1918-1925) in "Muzei” no. 5, 1984, pp. 152 - 164. See also Gerold Vzdornov, "Restoration and Science” (Restavratsiya i nauka), Moscow, 2006. Mikhail Nesterov, "I Continue to Believe in the Triumph of Russian Ideals” (Prodolzhayu verit v torzhestvo russkikh idealov): Letters to Alexander Zhirkevich, "Nashe Naslediye”, no. 3, 1990, p. 22. See the Trinity of St. Sergius Lavra collected material for 1919, Sergiev Posad, and, most importantly, the "Projects" for the preservation of the grounds developed by Pavel Florensky and Pavel Kapterev for the "Committee for the Preservation of Ancient Monuments and Works of Art of the Trinity Lavra of St.Sergius". See also M.S. Trubacheva, "The Committee for the Preservation of Ancient Monuments and Works of Art of the Trinity Lavra of St. Sergius, 1918-1925" (Komissiya po okhrane pamiatnikov stariny i iskusstva Troitse-Sergievoi lavry, 1918-1925). The fact of this meeting is confirmed in Trubachev's "Pavel Florensky and Mikhail Nesterov", p. 349. See also Nesterov's letter to Vasily Rozanov of 28 April 1916 in Mikhail Nesterov, "Letters" (Pisma), Leningrad, 1988, p. 268. Pavel Florensky: "Letter to Alexandra Mamontova" (Pismo A.S.Mamontovoi). In Fr. Pavel Florensky, "Works" in 4 vols. Moscow, 1996, vol. 2, pp. 409-410. From Florensky's letter to Mikhail Nesterov of 1 June 1920, Sergiev Posad. Quoted from Trubachev, "Pavel Florensky and Mikhail Nesterov", p. 357. From Florensky's letter to Anna Florenskaya of 18 September 1921, Moscow. Quoted from Trubachev, "Pavel Florensky and Mikhail Nesterov", p. 358. Mikhail Nesterov, "Letters" (Pisma). Leningrad, 1988, p. 325.